The night saw over one hundred people come out to raise a grand total of 1,900 Dollar. This past Saturday, people of the Fredericton community gathered together for a cause that hits hard locally, but is in fact dedicated to communities nearly 10,000 kilometres away. The Fredericton Peace Coalition, the UNB/STU University Women’s Centre, NB RebELLEs-Fredericton, and CUSO-VSO joined together to host Fredericton’s third Annual Benefit for the Revolutionary Association of Women in Afghanistan (RAWA). RAWA began in Kabul, Afghanistan in 1977 under the leadership of Meena, an activist who was eventually assassinated for her advocacy against Afghanistan’s fundamentalist forces. Today, RAWA continues to thrive as a political and social organization of Afghan women struggling for peace, freedom, democracy, and women’s rights. Knowing freedom and democracy can never be donated, what is needed from members of a community like Fredericton is solidarity and support. 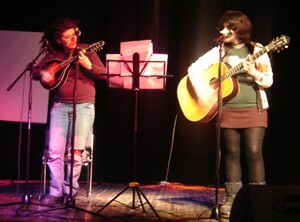 Saturday’s lineup brought local talent to the auditorium stage of the Charlotte Street Arts Centre. The evening started off with a reception of free beverages and finger foods, accompanied by the soothing musical notes of Mark Currie, Tom Whidden, Brian Calder, and Matt Leger. As these first musicians played, guests were encouraged to bid on the silent auction items displayed along one side of the room—a collection of art supplies, reading materials, tea sets, jewelry, kids’ items, gift certificates and more, entirely donated by the greater Fredericton community. Following the reception, the show officially began with a welcome from Michelle LeBlanc, representing NB RebELLEs and the Fredericton Peace Coalition, who spoke briefly on RAWA’s history and the importance of the support being shown. Claire Porter and Liv Fogel were the first act ­ two young women armed with a mandolin, guitar, and smiles. The emotional fervour in their voices gave way to Dana Ghanem, a nine-year-old Palestinian student, reading a poem for her native country. The child’s voice articulated, in a disarmingly sweet tone, frightening concepts of the country’s staggering violence. TJ Lightfoot next spoke of the similarity in the oppression of Afghan women and the oppression of Canada’s indigenous populations. Questioning the hurtful persistence of ongoing stereotypes and indignities, she echoed RAWA’s own call for solidarity and support. Local Talent, a band often spotted in Taymouth, graced the staged with performers Jim Emberger, Gordon Dougherty, and Genevieve MacRae. 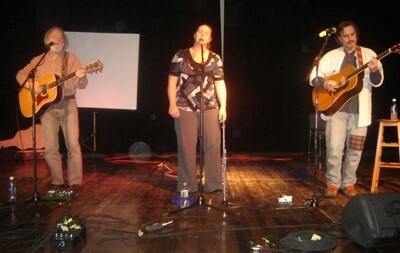 It was their Fredericton debut, during which they played four folk rock songs united by the universal theme of going home to carry the audience into intermission. With a startling stomping of rubber boots, the NB-RebELLEs reignited the evening with a gumbooting routine. Using excerpts of the manifesto created in the 2008 Toujours Rebelles/Waves of Resistance young feminist conference, the seven women (Heather Elliot, Michelle LeBlanc, Jessi MacEachern, Keri Ryan, Liv Fogel, Peggy Cooke, and Katie Young) presented a performance of heavy steps, slaps, and call outs to be rid of colonization, patriarchy, and the oppression of all peoples. Rosella Melanson, with the Status of Women in New Brunswick, followed with particularly topical words on the ongoing inequality here in New Brunswick. Tracy Glynn, not overcome by efforts in organizing the night, next graced the stage with a few final words on RAWA’s actions. Finally, having graced the benefit with his presence for the last three years, Saa Andrew greeted the end of the night with his lively reggae tunes. As silent auction items found their new homes and the success of the night began to dawn on the participants and organizers, an intergenerational dance party struck the auditorium floor. The night saw over one hundred people come out to raise a grand total of $1,900. The goal being to raise $2,000 by mid-April, there is an ongoing plea for donations of any kind. If you are able to or interested in helping support RAWA, please contact info(at)frederictonpeace.org. More about RAWA can be found online at http://www.rawa.org.